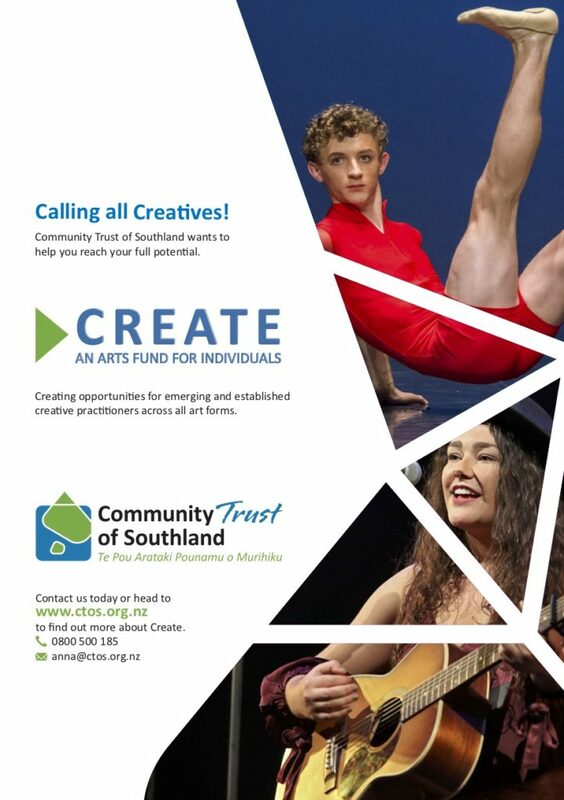 The Community Trust of Southland has today announced a new arts funding programme Create, Margot Hishon, Chair of the Trust said. The fund is designed to support individual emerging and established creative practitioners across all art forms. This new programme replaces the previous art scholarship programme, broadening beyond recognition and achievement to include creative skill development and production, presentation, exhibition and touring. “Arts, culture and heritage development is a key priority for the Community Trust of Southland. We have worked closely with groups and individuals in the art community to listen to their needs and we believe that this new programme will help to develop and strengthen both individual creative practitioners and the wider arts community. Our region has wonderfully talented people, across various art forms, and we want to ensure that we enable and create opportunities for their creativity and skills to grow” said Trust General Manager, Jackie Flutey. Arts Murihiku Art Advocator, Lisa Tou-McNaughton is excited about the new programme for the arts community saying, “Create is a wonderful opportunity for those working in the creative sector to develop their skills. Whether it be a lighting technician to up skill by attending a workshop or an established artist wanting to take the next step, I would encourage creatives to find out more about Create”. Create is being piloted for a two-year period, with a total of $50,000 per annum available to the community. Applications are welcome throughout the year, with successful applicants awarded up to $1,500 in the Recognition and Achievement category, up to $1,500 for Creative Skill Development and up to $5,000 for Production, Presentation, Exhibition and Touring.